Yokohama Tire’s youth soccer program has expanded again. The tire maker announced that it’s now the title sponsorship of the Manhattan Kickoff Classic Driven by Yokohama. Set for March 2-4 in New York City, the ninth annual Manhattan Kickoff Classic Driven by Yokohama is presented by the Manhattan Soccer Club and National Elite Soccer Showcase. The tournament features about 500 highly ranked national and international teams, with more than 150 college coaches expected to attend. 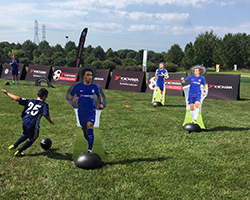 The popular Yokohama Skills Challenge, which helps kids of all ages develop many core soccer skills in a fun way, will also be part of the Manhattan Kickoff Classic Driven by Yokohama, along with clinics by English Premier League champion Chelsea FC coaches. “Manhattan Soccer Club greatly appreciates Yokohoma's commitment to our sport by shining a light on the thousands of young players and their families who come from near and far to compete in the Manhattan Kickoff Classic Driven by Yokohama. This unique tournament is played against a backdrop of the best that New York City, Westchester County and Long Island have to offer,” said Manhattan Soccer Club executive director Rich Corvino. Along with the Manhattan Kickoff Classic Driven by Yokohama, the tire maker’s youth soccer partnerships also include being the official tire of US Youth Soccer, exclusive title sponsor of The SSA Chelsea Classic Series Driven by Yokohama and title sponsor of the Needham Memorial Day Soccer Tournament Driven by Yokohama. Yokohama’s sports sponsorship roster includes Chelsea FC, Major League Baseball’s Los Angeles Angels, Nitro Circus Live US Tour, Nitro World Games and Spartan Race Series, as well as motorsports series such as the Porsche GT3 Cup Challenge USA by Yokohama, the Ultra 94 Porsche GT3 Cup Challenge Canada by Yokohama and several other motorsports partners. Manhattan Soccer Club (MSC) is a 501c (3) nonprofit organization with over 1000 players, representing more than 700 families. Soccer and day-to-day operations are run by full-time professionals, while a strong base of parent volunteers help with everything else. MSC is one of the largest member clubs of the Westchester Youth Soccer League; the New York Club Soccer League, a founding member of the Elite Development Program; and members of the US Club National Premier League.